I started this topic because nobody is talking about the Lego Cinematic Universe (LCU). It looks to be either an Adventurers or a Racers film. Also, Lego Cinematic Universe can also be shortened to LCU. I don't think that's taken. We don't have any real proof that the LEGO Batman Movie is even in the same universe, besides being Will Arnett, do we? I mean, I guess it's a fair assumption, but I can also see them saying something like "Batman's never been out of Gotham" or something that would completely alienate it from The LEGO Movie plot. I understand that it's a spin-off, but I think it's too early to say it's in the same universe. That's just my opinion, however. 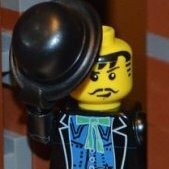 I'm surprised that they'll give us two movies in one year (Batman and Ninjago) just to let us wait two years until the Lego movie sequel gets released. Not the smartest marketing decision in my opinion. The Lego Batman Movie is from the same universe of Lego Movie.All Lego movies that are listed are canon. Also,there are rumors about The Lego Ninjago Movie 2(from Imdb.,but I don't think they are true). How do you know? Anyway we will wait and see. I mean, it is a pretty good assumption. Lots of movies have codenames. E.G. Star Wars: Attack of the Clones was nicknamed Jar Jar's Great Adventure. Well we don't necessarily know it's the same Batman that we see in The Lego Movie. Sure, it's Batman but it may not be Finn's Batman. This movie might be the imagination of a different kid. Hmm,will wait and see if this Batman is the same from The Lego Movie. Could be a different batman because of the utility belt piece? Also,so that minifig is smoking.I was thinking Lego is kid friendly. I don't think the first movie exists solely within Finn's imagination - in fact, we know his dad's imagination has as much of an effect as his does. I think it's more like Emmet & Wyldstyle's world being its own plane of existence, one which intersects and reflects the imaginary worlds Finn and The Man Upstairs construct in their basement, but which doesn't exist solely because of it. It's kinda sorta a little like the Mirror Universe in Star Trek, say, but bearing a somewhat different relationship with the other world. Well, it's something pretty small, I mean who will actually see that? It's there for less than a second. And also, child friendly stuff still has stuff like smoking and whatnot, like in the 90's. Heck, Ninjago had a drunk sailor in one episode. I'm surprised that they'll give us to movies in one year (Batman and Ninjago) just to let us wait two years until the Lego movie sequel gets released. Not the smartest marketing decision in my opinion. The LEGO Ninjago Movie was originally scheduled for September 2016 but was postponed to 2017. The same goes for The LEGO Movie Sequel, which was originally scheduled for 2018 and delayed to 2019. The spin-offs were confirmed to exist in the same universe early in their development. In this interview, Chris Miller says that outright: "The thing is about these movies is that each of them have their own tone and their own voice. We’re doing this Ninjago one with Charlie Bean, we’re working on the Batman one, and each one of them feels like its own movie, but obviously they all exist in the universe that the Lego movie existed in, and so finding that balance has been part of the trick." That's sort of how I saw things as well. In fact, we've seen that Emmet has some degree of agency even in Finn's world, so I think it's a lot more believable that they are two separate worlds that sort of cross paths with each other than that Emmet's world is a make-believe one that only exists in one family's basement. It's called "On a Wish and a Prayer". Since details are scarce and some people are not even aware of the film, I'll link and quote this two year old article. "Modestly, hopefully it will be the biggest race movie of all time,” Pearce said. “Imagine doing a race movie but having the ability to do it with Lego. So part Cannonball Run, part Wacky Races but with a real working class Rocky style blue collar vibe to it as well." So far, WB seems to have a pattern going with their animated Lego movies, with two films scheduled every other year (TLBM and TLNM for 2017, TLM2 and TBBR for 2019). So in continuation of that, we may see two other films announced for 2021. So when do you expect WB to announce potential future movies? Also, WB's department WAG (Warner Animation Group) is developing a Minecraft movie for scheduled release in 2019; so I was wondering if, given the success of Lego and Mojang's product partnership, we could see the Minecraft license incorporated into Lego's cinematic universe for the promotion of WAG's other developing film franchise. Do you think that could be possible, at least as character cameos? As character cameos, sure. I certainly don't expect a full movie or anything like that, though. I also wouldn't jump to the conclusion that the current "pattern" of releases will hold—don't forget that TLBM and TLNM were only in the same year due to production being pushed back on both. I imagine that an annual release schedule would be preferred if possible, since having two movies per year sets a greater risk of both the movie sets and the movies themselves cannibalizing one another's sales. Of course, the performance of TLNM will probably influence future plans greatly. That's true regarding annual release dates. Last year, I was sort anticipating TLNM to move to a February 2018 release, for not only WB's but Lego's sake also. But, here we are with two Lego movies tightly squeezed into one year, each one spawning more sets apiece than The Lego Movie had ever did. Still, I do feel that at some point next year, WB will end up moving The Billion Brick Race's release date from May 2019 to either a Christmas 2019 or February 2020 date instead. Where WB has that film scheduled now is way too close to The Lego Movie sequel, especially for Lego I feel.